Yikes, this is late! I tried to get this done this morning before it went live on Some Odd Girl blog but I think my computer is trying to crash, or it is just old and tired, or it just hates me...I can't decide. So, I'm finishing this at work...SHHHH!!! I did rush in early though so it wouldn't run into my work day. So for those that are just joining me or have been away for awhile, I won a guest design spot over at Some Odd Girl...YAY!! I love Kristy's stamps, her images are SO much fun to color up and play with and I've had a blast playing with them in Odd land. So I got to use the new digi release which is this awesomely majestic MOOSE. 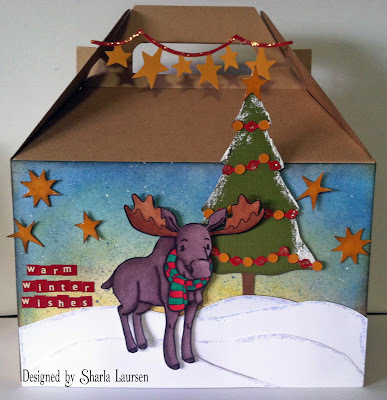 I colored the moose with copics, the snow is hand torn from white cardstock and lined with stickles glitter, the tree, stars and garland are all from Joys of the Season Cricut cartridge and I colored the background with Distress Inks and my sponge applicator using blues and I think Antique Linen. I did add a little Snowtex to the tree and spritzed the background with spray ink. I had this cute kraft gift box that I thought would be perfect to put a scarf, beanie and maybe some gloves in for a warm winter gift. I hope you like it and hope you will go check out my post at Some Odd Girl!! What a cute little scene you created with all the elements. Thanks for joining us this week at Holly Jolly! You create a beautiful christmas scene Sharla. Thanks for joining us this week at the digi makeover challenge. Soooo cute!! LOVING that moose!!! !